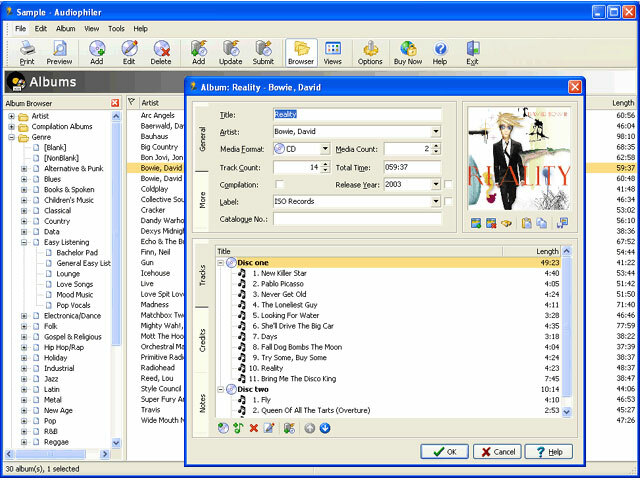 Audiophiler Music Organizer will organize your music collection. You can view and print reports, sort and group by any field. You can keep a record of where and when items were purchased and how much they cost. Loading your music collection is quick and easy. Put a CD in your CD-ROM drive and Audiophiler will download all the album information from the Internet CDDB service and load this into your database with one click of the mouse. ...... You can now read album, and track details directly from CD TEXT formatted discs (including your own CD-Rs). Several performance improvements have been included to speed up the loading and editing of albums for large databases. Speed improvements and better searching capability for the Web Search and Cover Art Search functionality. Audiophiler Music Organizer can now auto-detect your proxy server configuration. * Catalogue your entire music collection regardless of media format. * Quick and easy data entry of CD collections using the Gracenote CDDB Service. * Advanced sorting, grouping and filtering by any field. * Keep track of your music collection for insurance purposes and your own peace of mind. * Attractive and easy to use interface. Qweas is providing links to Audiophiler Music Organizer 1.6.3 as a courtesy, and makes no representations regarding Audiophiler Music Organizer or any other applications or any information related thereto. Any questions, complaints or claims regarding this application Audiophiler Music Organizer 1.6.3 must be directed to the appropriate software vendor. You may click the publisher link of Audiophiler Music Organizer on the top of this page to get more details about the vendor.